The most awaited monsoon may have knocked the doors of Mumbai, bringing cheers on the face of the city dwellers. But the rains are proving to be a curse to nearly 60,000 homeless persons, especially infants, the sick and the aged. A right to information (RTI) reply has revealed that, despite clearcut official guidelines, the government has not cared to build 124 community shelters to protect them. The response received to the RTI plea by the Ghar Bachao Ghar Banao Andolan (GBGBA) has revealed that, while there are seven night shelters in Mumbai, not one of them has been built by the Municipal Corporation of Greater Mumbai (MCGM) as per the National Urban Livelihood Mission (NULM) guidelines. 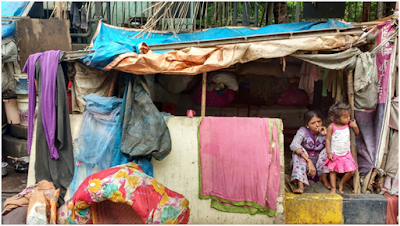 While one of them – in Byculla – has been vacated because of its “dilapidated” condition, in rest of the six, near Alankar Cinerma, in Byculla, near Wandhede Stadium, in Bandra West, in Andheri East and Malad East, there is a total capacity of just 320 persons.